In March the Chancellor and Chief Secretary praised the Civil Service for delivering major savings during this Parliament and asked the Minister for the Cabinet Office to consider what further savings we could make in the future. As, respectively, Head of the Civil Service and Chief Executive, we have been working hard with the Minister for Cabinet Office, the Treasury and colleagues across government to plan how the Civil Service can work even more efficiently in the future and still deliver world class public services. It is worth reflecting on how far the Civil Service has already come in recent years - more services are being delivered digitally, we are smaller than we have been since the Second World War while delivering more than ever before, and we are up-skilling our staff so we are capable of meeting the challenges ahead. The report that the Government published today set out its strategy for the next Parliament. But what does the Autumn Statement mean for us as a Civil Service overall? We will need to deliver an additional £15-20bn over the next 5 years. This is a big number which is difficult to relate to, but we will all have a part in delivering it. So what does this mean in practice? A continual focus on getting value for money - we need to enhance commercial skills across the board in the Civil Service so that we can leverage our scale and our scope with suppliers. Skill levels need to be increased at all grades, from experts to those of you who make occasional commercial decisions, and there will be continued efforts to support you in getting the required learning. Our commercial models need new and innovative structures that allow us to tackle the tough decisions we face in the future. But above all it means each and everyone of us needs to keep a simple focus on cutting costs, identifying waste and looking out for the taxpayers' interests just as we would our own. More digital services - we want government to be as good as the private sector with the digital services it provides. A cross-government approach will allow us to reduce costs and make interacting with our services a better experience for the public. Over time it should also mean better IT kit in the office so we can all do our jobs more effectively. As well as modern IT we need modern skills so that we can work smarter, more flexibly and effectively. More collaboration – greater cross-government collaboration is needed, both between departments and between departments and the centre, in order to create joined-up solutions to challenges faced. Reducing Fraud, Error & Debt – great progress has been made in this area already, but we need to continue in our efforts to reduce fraud, error and debt across government. Better working environments - our property strategy means we will reduce the amount of office space we currently occupy. We will have more shared office spaces that meet the needs of a modern workforce. This will let us share more resources and build a more unified Civil Service. Better leadership and a more innovative culture - achieving these goals will require effort from us all. To implement these changes we need our leaders at all levels to work closely with their teams and start to consider how things can be done better. We need leaders that will listen and let their teams try new things, challenge the status quo and learn from mistakes made. We will be launching our Leadership Statement shortly which will enable us to really consider how our leaders can become better at guiding the Civil Service. We know that the Civil Service is up to the task – since 2010 you have already helped to save £14.3 billion through efficiencies and reforms. By improving the skills of civil servants in key areas, we are in a stronger position than four years ago to continue the programme of reform - but it won’t be easy. The prize is a Civil Service that is even better to work for, that attracts and rewards excellence everywhere, provides clear paths to progress for all its people, and creates a highly skilled, modern workforce that is free to innovate, confident in its abilities and in the conviction that it is providing the best, most cost-efficient public services it can. Quote: "The prize is a Civil Service that is even better to work for, that attracts and rewards excellence everywhere." Is this a joke? I see only years of pay freezes and massive and unjust rises in pension contributions. More to follow doubtless. How does this make for a Civil service that is even better to work for? Of course a different matter if you are an MP ! Well said John. I am really surprised that your comment hasn't been deleted for telling the truth!! Unfortunately this article falls into the usual trap of talking about "leaders" in the Civil Service as if they are the norm. We have very very few genuine leaders in the Civil Servce, despite senior people always referring to themselves as leaders. What we have is a large number of "shovers", people in senior positions who shove those below them into doing what their seniors have told them to do. Until we have real leaders, which seems unlikely, the Civil Service will continue to be the dismal place to work that a large proportion of its employees consider it to be. "The prize is a Civil Service that is even better to work for, that attracts and rewards excellence everywhere, provides clear paths to progress for all its people, and creates a highly skilled, modern workforce that is free to innovate, confident in its abilities and in the conviction that it is providing the best, most cost-efficient public services it can." Those at the top need to spend a few days on the shop floors to get a grip on the reality of what it's really like. 'Attracts and rewards excellence everywhere'? No pay progression, terms and conditions in the race to the bottom, and a punitive unfair performance management regime. 'Highly skilled modern' workforce - those skills need to be paid for, if the Civil Service must upskill, it needs to offer appropriate remuneration. And when the skills do arrive, the cuts come soon after and the skills are lost again. As to being more cost effective, how many days (and £££s) of production are lost due to managers and staff writing reams of evidence to support the performance management system? 'Public Service pay will remain frozen until the deficit is cleared '. In real terms our pay has deteriorated for years and will continue to do, even though the Chancellor recognised the achievement for the public service. We (civil servants) pay for a worldwide depression and the government take the opportunity to follow their own agenda. I can only agree with the above...unless you call £20 of amazon vouchers in 8 years as a 'reward for excellence' ! "since 2010 you have already helped to save £14.3 billion through efficiencies and reforms" - you should also add pay freezes and increased pension contributions to that. Only a week or so after the results of the 2014 Survey and these grievances are simply ignored. Tells you everything you need to know really! As things stand, it is very sad that UKVI is about to lose so many good and talented front-line agency workers on Christmas Eve shortly to be followed by many on fixed term appointments. To compound this, many of these people have been successful in recruitment excercises, but cannot take up roles due to the present recruitment 'chill'. This does not seem like much of a 'prize' for these individuals. I agree with John Hudson. Over the last 6 years what have we had? A 3 year pay freeze and 3 years of 1%, while everything else has increased - energy prices, petrol, food etc. The workload has increased and the staffing levels have dropped and apparently, 1 million public sectors to lose their jobs in the future. The stock answer to these questions when anyone says anything is: "You can always look for another job". Thank you DWP. That's assuming you're not one of the million that they are getting rid of !! John Hudson has said it correctly. The only future for Civil Servants and the public services is bleak and grim: if the economy improves the old,old line about the public sector pay having to be kept down "to be an example to the rest of society regarding pay rises" will be trotted out by the politicians (of any colour) and if the economy doesn't improve then the same excuse is used! The Government feeds us empty platitudes but, as the old saying goes, "fine words butter no parnips"! Thank goodness I've not long to go before retirement - I feel sorry for all public service colleagues who will, in the future, have to endure the endless stream of hipocritical politicians saying one thing for the public services and doing the opposite for themselves. If MPs feel their independant pay research unit's recommendations are so valid they MUST be implemented at this time why don't they do so for the results of the pay research unit's for the rest of the public services. At the autumn statement it was stated that to increase spending and generate more income through taxation you need to ensure that the workforce is paid approprioately so that there is a general feeling of wellbeing and more people have disposable income. Does this mean civil servants income will now rise in line with the retail price index. Ive worked for the Department for over a decade, still not on my max of my pay grade. Could Sir Jeremy Heywood advise why this is ?. About 30% of staff in my office completed the staff survey, is it time this was scrapped and the money saved put to better use? IT in the department is also not up to scratch. Could we have an undercover boss approach so folk can see what goes on at the front line? it may open a few eyes. While I sympathise with all the staff who still fail to reach their maximum please spare a thought to officers like myself who reached our maximum many years ago and who aren't seeking promotion. I have had non consolidated bonuses only for 4 years so my salary has not increased at all and will not increase if these austerity measures aren't addressed. In real terms this also has a direct affect on my pension as I being a long serving officer of 34+years have a final salary pension. This used to mean a lot to me but it looks like I will retire on a pension based on a salary that hasn't increased (even though my pension contributions have) for many years. Do the Government really think we are stupid enough not to realise theirs is a 2 birds with one stone approach in that their austerity measures don't just affect pay but our pensions. They will save so much money long after these austerity measures are history as they will save so much more from reducing the pensions we once believed we would get! They (Government) as always rely on the fact that most of us still turn up to work and do the best job we can..no not for them but for our colleagues and the public we serve. Well said. Many don't realize the severe dent to their pensions until they get there. i have been a Civil Servant for 38 years, I am at the max of my salary and have not had a pay rise for 6 years, not even a non contributory bonus. People outside the CS would probably say I am on a good wage but I am suffering from rising costs in gas, electric, food, travel etc so basically I have had a pay cut!! I am worrying if the interest rate goes up that I won't be able to pay my mortgage! I love my job, and the people I work with and this is all that gets me up every morning. My actual take home pay has reduced over the last 2 years, largely due to the fact that my pension contributions have increased by 136%! Obviously, this does not even factor in the impact of inflation over this period. Thankfully, I will be retiring in the very near future but I I have sincere sympathy for those who will remain in the service. Should the economy ever improve, I feel that the CS may experience serious difficulties in recruiting the quality staff it needs, on the pay it offers and it will serve it right. "The efficiency savings have helped line our pockets that bit more, so thank you"...is what he should have said. Also - how do you prove this 14.3 billion? Has the number been calculated somehow, or is it another case of peddling lies in such a way to make it sound believable? That is an apt summary! Seems to me that the biggest savings to be made are in the benefits system. That`s the millstone around the country`s neck. We`ve already paid enough of a price. There are a lot of similar conclusions in a recent report about how public services need to adapt in the future to deal with the triple challenges of reducing budgets, ageing population & rising expectations. Commissioned by ministers, the Service Transformation Challenge Panel also concluded that public services needed to be much better at both digital and collaboration. But not just collaboration department to department, also between local public bodies and between department/Whitehall and local public bodies. The Panel argue that local public bodies best understand local priorities and so their input is needed to design the services people want and need but at less cost. The report makes a number of recommendations for how better collaboration could be incentivised, including changes to funding and bringing together the professional training of public service managers whether they're in the civil service, local government, police, health, etc. Quote "We need leaders that will listen and let their teams try new things, challenge the status quo and learn from mistakes made." Im glad to be part of the drive to cut our expenditure. Its also interesting how since closing our canteen/restaurant that we have regular management meetings and lectures with a buffet at £7.50 a head for sandwiches! plus £2 per head for fruit and pastries. Of course when senior management meet.....that budget is £12-15 per head. Its all spin. So much of it makes you dizzy. What needs to be remembered is that a tree is only as strong as its roots. This tree is wobbling due to the loss of many grade staff that give the civil service a firm ground and AGAIN we are top heavy with SCS who continue to work as they always have and keep reinventing the wheel which inevitably always falls off. The staff survey is proof of that, but still they won't listen to what is being said much preferring to keep on selling us spin. So no mention of futher pay freezes (or should I say cuts) that were announced. I agree with John the Civil Service I work for is worse to work for now that ever. There is no reward or recognition for hard work. Many of us work all the hours god gives us to do a good job but get nothing in return. With continued pay freezes, raises in pension contributions could some one please tell us what the benefit is? What is a real kick in teeth is Mr Cameron saying yesterday that income will rise by 4% - but obviously not for all of us. Privatisation and Government Owned Companies that’s the future for us. I totally agree with John Hudson. "The prize is a Civil Service that is even better to work for, that attracts and rewards excellence everywhere." Hmmm. With year on year pensions contributions, pay freezes, extra work due to staff leaving as part of the cuts, jobs outsourced and privitaised, a reduce pension scheme from next year terms and conditions cut back and an imposed and discredited so called competeny based managtement performance system. In addition results of staff surveys, from this year, show civil servants are not being adequately rewarded for the work we all do. How is all of these designed to attract and reward excellence exactly? If ever there was a statement that is totally out of touch with what is happening across the civil service this is it! There seems to be a mistake in that announcement. It says "We will need to deliver an additional £15-20bn over the next 5 years". If someone gave us an extra £15bn, I’m sure we could deliver it. Unfortunately, it seems they intend that we should deliver £15bn less. I presume it's a mistake, rather than an inept attempt to portray a massive cut as some sort of generosity. You repeatedly stress the need to increase skill levels throughout the Civil Service. To "attract and reward excellence everywhere." Nice aspiration, but sustained pay restraint, together with the seemingly endless erosion of terms and conditions is going to be your biggest challenge in this respect. Civil Service pay and rewards is quite frankly a ticking time-bomb. How do you intend to attract and retain talent when the appertaining prospects of pursuing a career within the Civil Servive are becoming continuously increasingly unattractive? So much to say, but without fear? Same old same old, buzz words, mantra, ultra-rose coloured spectacles and nothing of any substance in relation to the real world that most Civil Servants have to cope in day in day out. It's like the whole article has been written by committee. I'd like to comment more but have to dash off now to my next Building Our Future event. I have been a civil servant since the mid 80s and can honestly say I'm proud to be a civil servant. There have been a lot of changes over the years and many of them for the better. I saw a lot of waste and turning a blind eye to poor performance but this is gradually changing. Don't get me wrong, there is still plenty to do on this front. I know that we have had pay freezes and our terms of conditions are changing (I personally hadn't recieved a pay rise for 5 years even when I was promoted) but I think the private sector is much worse. I have friends who work in the private sector who are finding it difficult to find jobs and even when they do they are not secure. If you are a harder worker and want to make a difference then the civil service is the best place to work in. did you forget to mention pay? Why are there differences of up to £16,000 in STARTING salaries for staff at the same grade (SEO) in different London departments ? They're having a big laugh, are they that out of touch with staff and the meagre salary we get, no pay rise for years to come as well. HMRC lower grade staff are suffering now and have been for five years. We didn't get the 10% pay rise as did MP's, most of us will not even have heating on in our homes this winter, we can't afford the bills. We have to pay more for our pensions, work another 8 years and if you live long enough ( most low wage people do not live to old age ) get a pension less than you thought. Those in charge should be ashamed of themselves. As so ably explained by most of the comments above, what a ridiculous piece of spin this article is! Don't encourage them - they will be writing a business case as we speak to pay a consultant from the private sector to come in and spin a little more. Given the glorious future for the Civil Service that has been set out by our esteemed leaders I am really sorry that I have decided to retire next March. Yes I am being sarcastic. And my experience of the private sector is rather different from Deb Hunt. After successfully persuading my children not to join the public sector I am pleased that as hard-pressed private sector employees their basic pay is far higher than my EO salary and they get sizeable bonuses on top. Quote: Creates a highly skilled, modern workforce that is free to innovate, confident in its abilities and in the conviction that it is providing the best, most cost-efficient public services it can. If this was a story book it would be a romantic ending, but it’s NOT and far from it. Value for Money - while we are paying contractors the amount of money we do and bringing them in for feasibility studies to see how we can save money,,, HELLO!!! We pay thousands of pounds for what?, what you should have done is listened to the personnel on the ground, who could tell you how to make changes and deliver value for money. It’s the same old, same old, higher grades do not want to listen to lower grades, for fear of lower grades having more knowledge and expertise than they hold themselves. You’re going to have to go a long way for the Civil Service to become an attractive employer with future innovations, technology and attractive wages to keep the work force happy and contented. The world around us is moving at such a pace we are endangering our selves to becoming extinct and loosing what little we have left of our own expertise to the future world. More spin than an estate agent's advert. Just be honest and say that we'll be further squashed in offices hot desking, no development or chance for promotion, more job cuts and more pay freezes/other reductions in terms and conditions. At least it does away with worrying about an exceeded box marking if one is on a pay freeze anyway. "we are up-skilling our staff so we are capable of meeting the challenges ahead." We are getting rid of staff and so we need existing staff to take up the slack even if it means using skills they are not expected to have in their present grade. Increased workload, requiring skills outside of their band for no extra pay. "we will reduce the amount of office space we currently occupy. We will have more shared office spaces that meet the needs of a modern workforce." We wil be closing buildings. The staff from these buildings will have to move to existing offices, and you will all be squashed in like sardines. As usual treating staff like cattle without any consideration for their welfare. An elastic band can only stretch so far until it snaps. It may be true that "we are smaller than we have been since the Second World War while delivering more than ever before", but that's because so many services are now contracted out. Civil Service still hasn't got contract management right (it's a little-reported fact that money lost to procurement fraud is around the same level as that lost to benefit fraud and error), plus contractors can drive down wages for non-public-sector workers now doing public sector work. Somehow, this is cited as progress. The Government wants high quality employees, yet it has failed to pay competative salaries, this has resulted in the use of contractors being brought into do the job. They do the job but less effectively and without understanding the full impact of what they fail to do. This means that the value for money question is not satisfied. It is time the Government recognised the contribution that Civil Servants make to society and put in place a well thought through pay package. Perhaps the electorate should demand that MP's demonstrate their worth through performance related pay, frozen for 6years and reduction in their expenses given they are only really public servants. The employer is not interested in retaining Civil Servants, as it has been deemed from beyond the clouds that private contracted services are more 'efficient'. Never mind that, coming from backgrounds which detest the very concept of public service, the ones insisting on cuts stand to benefit from their associations with contractors, and are treating the country like a restaurant they can smash up and walk away from with impunity, insulated by wealth. Agreeing with Godfrey, can we demand a full spreadsheet of how much private contractors really do cost the taxpayer? A private company has recently taken over a department in an area close to where I work. A retained Band E1 is paid £20K but the contractors sat alongside her doing the same job are being paid £24K. The recently ex-MOD employees are still on old terms and conditions. So, if the MOD can ensure the Contractors pay their admin staff more .... what is going on? Quote: "The prize is a Civil Service that is even better to work for, that attracts and rewards excellence everywhere, provides clear paths to progress for all its people, and creates a highly skilled, modern workforce that is free to innovate, confident in its abilities and in the conviction that it is providing the best, most cost-efficient public services it can." Some prize when all we've won over the past few years is effectively a pay cut, and looking foward year on year are more pay cuts. That obviously makes the Civil Service an even better place to work that rewards excellence, some statement!!! If I had been tuped out to the private sector alongside other colleagues five years ago, I'd have had decent annual payrises and received a Christmas bonus each year. But no, I remained in the Civil Service and now earn thousands less than colleagues working alongside me, along with a substantially degraded pension. Believe me, there are NO prizes for being a Civil Servant. Moaning about it is not going to change the situation. Civil Servants are being scape-goated and exploited, and there's no indication that the slashing attack from Government is going to let up any time soon. If anything, it is going to gather in momentum. Wages have devalued by 15-20% over the past four years. That is wholly unacceptable. Now is the time for action. Eagle, you say "Moaning about it is not going to change the situation." But how else are they to know our feelings? We need to moan louder and more often. Strikes don't do anything, they are pointless and cost the striker a day's pay. The squeakiest wheel get the most oil (apparently). Not really sure what else to do but moan! After years of pay freeze, increases in Pension contributions and more years of austerity ahead , the Government needs now to show us it values its civil servants and reward the hard work with which we are continuing to implement their policies . I do wonder if some legal bright spark could investigate the full terms of employment law on this. Two people doing the same job but on different salaries .....? It wouldn't stand up in court surely. We know what the bulk of the 14.3Bn "saved" has already cost the ordinary hard working front line civil servant, and that that "saving" didn't stop 87,000 of those civil servants along with 17,000 members of the armed forces from being made redundant. It doesn't take the brain of Britain to work out what another £15-20Bn of "savings" is going to entail. You're right that we need leaders that will listen, but as the head of the civil service that process needs to start with you. I won't waste my time or yours repeating the issues that have already been stated countless times on just about every civil service board and blog that there is including that of your predecessor. I will merely entreat upon you act on your own words and listen, and most importantly act on what is being said. The real prize would be another round of VERS so that we can all leave this appallingly managed organisation. It is perhaps telling that every year 1 in 10 senior managers are placed in a category which dictates that they need to undertake a performance improvement plan. In the private sector I doubt more than 50% of our "Leaders" (I use the term loosely) would retain their jobs - that's why they hang on for grim life, they are unemployable in the private sector. I am wholly ambivalent about this blog, which is just another example of "buzzword bingo" compiled by a career civil servant who has lost all touch with the staff at ground roots. These blogs exist purely to provide ego trips rather than any meaningful information for the staff. On the plus side the comedy value is inestimable "The prize is a Civil Service that is even better to work for, that attracts and rewards excellence everywhere, provides clear paths to progress for all its people, and creates a highly skilled, modern workforce that is free to innovate"
Everyone complaining about wages should look at what has happened in the private sector - just the same. It is not justificable for civil servants to get more than everyone else. Reduced pensions are an inevitable consequence of an ageing population. The real concern is the £91Bn the UK is oborrowing this year - money that your and my children will have to pay back. The 'savage cuts' we have seen so far are nothing of the sort - government spending has remained stable. What is needed is significant cuts to return the givernment finances - our finances - to balance. That means more wage restraint for at least the next 10 years. You will be poorer. We have no other option. We have been living beyond our means. The world does not owe Britian a living. Get used to it. Is it justifiable, that Civil Servants working alongside ex-Civil Servants, those former colleagues who were tuped out to the private sector but continued to remain in post, doing exactly the same jobs that they were before, now earn thousands of pounds less than their colleagues, while doing exactly the same work? Private sector contractors working in the public sector have fared much better than their public sector counterparts. Do you see why this leads to resentment and frustration at the civil service leadership, when they then try and tell us that "The prize is a Civil Service that is even better to work for, that attracts and rewards excellence everywhere"? But Andrew, how is it possible to even have this attitude when you see the lowest earning Civil Servants suffering pay freezes, while Civil Servants at the top are somehow managing to cream off tax payers money for 10% pay rises and bonuses. The likes of myself have to rely on the meagre crumbs of reward and recognition to get any sort of 'pay increase'. My wages (less than £15,000) are not actually covering my everyday expenses. But I'm guessing from what you wrote that yours do. For Christmas this year I've had to warn my family and friends that no-one will be receiving gifts from me, that's how inadequate my pay is. Yet we are being asked to do more work than we have ever done. Is it our fault the economy is in the state it is? Or are we already busting our guts to meet targets while are colleagues drop like flies? And they want us to do MORE! You are absolutely right " The world does not owe Britian a living", but my employer owes me one. 'our' colleagues I meant to say, not 'are' . I wish they would introduce an edit button! "It is not justificable for civil servants to get more than everyone else"
In my area of specialisation I could walk out of the CS into a private job doingf the same technical work, with less bureaucratic nonsense to content with and earn between 30% and 50% more than I do here. I stay in the CS out of a (probably) misplaced sense of loyalty to the Crown and the people of the UK. So I do find comments that imply I'm earning more than my private practice colleagues rather laughable. Also pursue and claim back monies owed, ie tax avoiders, fraudulent claimers, it cost more to take these people to court and then send them to prison and then put them on benefits again, than what we get back from them, I know we need to do these things, but make them pay for it. The banks put us in this position, but have they been penalised ? I agree with the sentiment about the need to value civil servants, but we must accept that the current shape of Government, the Civil Service and spending is unsustainable. Government has become unnecessarily bloated. There is still bundles of fat that can be cut from across HMG and jobs that add no value to the UK economy or public service. For one, the taxpayer-funded union jobs in most government departments need to be cut. There are also several layers of "senior" management that can be cut, with a likely rise in productivity as a result. I support the steps that are being taken and agree more surgery is needed, but I also share the pain of the 1% pay rise. It's part and parcel of working for the public sector - job security in return for low pay. The problem being is it's the undervalued workers whos jobs are being cut- not the "bloated layers of senior management". Also, how much lower are you prepared for pay to go in return for job security - Many of our staff including myself, are already claiming benefits to supplement what now passes for a salary. Hd of Civil Service and CE - PLEASE stop writing such utter rubbish. Your staff are not fools. The reality is clear for us to see and you lose complete credibility when you attempt to spin unadulterated nonsense. A Civil Service that attracts and rewards excellence - how far from the truth can you get. To put the cherry on top. The House of Commons this evening voted by 146 votes to 5 approving legislation to enshrine in law the principle that the foreign aid budget must never fall below 0.7 per cent of GDP, currently 11.5Bn pounds a year. I'm sure hard working civil servant will appreciate that the proceeds of their upcoming sacrifices are being put to such productive use. Yes it's attractive this prize isn't it? "Reducing Fraud, Error & Debt – great progress has been made in this area already, but we need to continue in our efforts to reduce fraud, error and debt across government". instead of comparing senior civil servants, when are the government going to talk about the majority of the workforce. Loyal staff on wages less than the average, who have seen real pay cuts and are going to see even more.Morally this is so wrong, we are not asking for better rewards we are just asking why we are being targeted for others mistakes, whilst we watch MP's caught in expenses fraud, paying members of their family to work for them, incredible pay rises etc. How interesting would it be if we used the Independant pay research unit. The people who make these decisions we trust with running our country, these people who ask us to deliver quality, I wonder how many of them would deliver quality to the nation if they had to justify themselves through performance related pay, frozen for six years and reduction in their expenses given they too are really public servants. After all, we are all in this together. No amount of PR can replace the genuine belief of staff. The above comments demonstrate that this is lacking. My beliefs are that the civil service will be most empowered when we stop auctioning the private sector, cease austerity, and pay for better govermnental services with tax on multinationals and corporates. Taking away the reward that if you work hard, are efficient, get top box markings, get recognition and your salary still won't go up any faster than anyone else is the MOST important demotivator. Now you only get a bonus if you get a top box marking which the target is 5%[?] and not worth much after tax anyway. Those of you at the top - wake up and smell the coffee because those that are left standing in the Civil Service are most likely not going to be the top performing staff. I am nowhere near the top of my band and never will be no matter how well I do - and strangely I was one of those top 5% last year. Lifting the fog of relentless spin from your blog, the Autumn statement reality for the vast majority of civil servants is far removed from your utopian vision. It means a continuing pay freeze beyond 2015 devaluing our ‘reward’, following five years of job/pay cuts, along with ever increasing pension contributions. More for less indeed. From April 2015 lowest paid employee pension contributions rise yet again, from 3% to 4.6%. That represents an immediate 50% cost increase for those paid below £21K, which comprises over half of the remaining Civil Service workforce outside London. Previous increased costs were phased over 3 years, with 0.5% increases each time. The average Civil Service ‘pension’ is already under £6K. Doubtless your future vision sees that falling average pension value as yet another success. More of a base metal pension than gold-plated. I’m afraid the reality of the Autumn statement is more years of not just feeling undervalued, but of staff finally realising the lie of ‘we are all in this together’. Clearly we aren’t. Please stop constantly spinning the opposite view, as the responses to your blog clearly show very few still believe you. 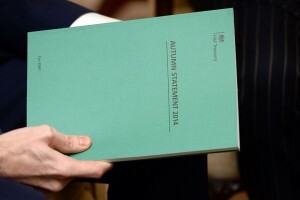 I am dismayed by the introduction to what the Autumn Statement means for the Civil Service, particularly the delivery of an extra £15-20bn over the next five years with the tag line: "this is a big number but we will ALL have a part in delivering it"
I read this as, "this is a big number and those left will see it delivered." In regard to George Osborne's statement, and as a Civil Servant, I find a great deal of it significantly worrying. He requires a greater saving in the first two years of the next parliament then he achieved in the last four years of the previous one, with continual savings up to 2018/19 to help reduce the deficit. The prognosis for the majority of Civil Servants is for far harsher austerity over a longer period of time. In response to the Autumn Statement Paul Johnson from the Institute of Fiscal Studies has called the cuts required to meet The Chancellors expectations "Gruesome", with some non-protected Gov't Departments suffering budget reductions of 40%. Let's be clear here, this scenario is if all the variables are favourable, but judging G Osborne's track record, this is unlikely. He said in 2010 that he would half the deficit, he did not. He also over estimated economic growth and tax receipts, so the reality could be a lot worse. Even under the most agreeable conditions the IFS believes that up to a million Civil Servants could be axed; "job security for low pay" to quote a blogger, is not on offer, insecurity for scant remuneration is. Furthermore while government borrowing services the deficit, our National Debt increases, but this is whitewashed out with flagrant electioneering and spin. Similarly I cannot understand why people defend the reduction in pension benefits with the weary line " We're living longer so large pension benefits are unsustainable " This is neither helpful nor necessarily true. This is a diktat from Westminster, the very same people who have gone to great lengths to protect their own provision in old age. What demographic did they base their calculations on? Remember also, a previous Government, misadvised people to remove money from occupational schemes to private ones, which led to the Pensions Case Review at considerable cost to both the private and public purse. It is spin and more importantly overlooks one major and politically sanctioned act of financial plunder and pillage. In 1997 the Government at the time abolished the Pension Fund Tax Credit- this enabled Pension Funds to shield their investment dividends from tax. Once again, these expensively educated, disingenuous demagogues, who solely believe in their own rectitude and predictive acuity, failed to make contingency for failing equity values and falling interest rates, that wiped off billions from the cumulative pension pot. So while Mr Osborne, or whoever follows after him, pursues a policy of tax receipts offsetting borrowing, whilst effectively reducing the means of collecting said taxes, overestimating economic growth and battling low inflation he will continue to make cuts in public spending, because it is easy and demonstrable. I am not an advocate of left-wing doctrine or political affiliation but I do believe in fairness for all and compromise, and it seems in pitiful short supply from our ruling elite, and only through a collective voice will we be heard. Nobody would elect to have a Cuckoo in their nest but they may have voted for one. I haven't got the time to read all that has been said above but read many of them and I agree with everything I saw. As a recent promotee who had to pass TPQ's to be made substantive and no pay rise at all last year because I hadn't completed them (I have now) plus no increments following promotion; I know exactly how people feel. What amazes me is that despite all the misery heaped on us by the Government through our employer, so few people seem to want to really support our trade union. If we don't, PCS has little chance of negotiating successfully with the government to get some improvements. Wow. I can't recall ever having seen such an interrupted outpouring of bitterness, complaint, and demoralisation on a civil service blog. There's not much I can say that hasn't been said already. I came here from the private sector in 2003 via redundancy (constructive dismissal to be precise) in the private sector, and the New Deal 50+, which got me back into work. My observation is that (historically at least) employee 'shelf life' is less in the private sector than in the public sector. Historically, wages may have been higher in the private sector, but so was job uncertainty and pension insecurity. But that is all changing, with 'shelf-life' prospects in the public sector lowering as we 'adopt the best practices of the private sector', and through erosion by stress (from higher targets, lower resources, and consequent growth in bullying management styles) and worry (over rising costs and falling wages).
" The Panel argue that local public bodies best understand local priorities and so their input is needed to design the services people want and need but at less cost." I should like to see fewer numbers of higher grades (G7 and above ) in the civil service, and I should like to see them much more evenly spread around the UK regions instead of clustered in London. Maybe then they'd be a little less inclined to talk spin to us, and a little more inclined to speak truth unto power, and to be properly informed when they do. I'm retiring before long, and am actually doing a busy worthwhile job for adequate remuneration at present. So my concern is not for me but for building a successful civil service into the future: one where people are less distracted by worry and more happy, engaged and effective. There IS such a thing as the public service ethic, and it matters, and will matter more I think in the challenging years ahead. In fact I'd go as far as saying it ranks in importance alongside the need for a responsible, ethical banking system. Printing money for one seems arguably as relevant as printing money for the other. And in the end its one or two talented generals, and a lot of engaged footsoldiers prepared to follow them, that win a war. I have just returned to the civil service after 5 years. I am earning the same salary that I was receiving 10 years ago. Obviously my rent,council tax and bills have in creased in that time. Since I returned to work my pay has not been correct and consequently I am now in debt. It would seem no one is responsible.When I am payed at the end of this month I will barely have enough to pay my bills let alone my debts.What am I meant to do ? He!he!he!he!….reading this, it is sounding rather like Sir Bob Kerslake handed over his script to Sir Jeremy when he left the post….the only difference between the rhetoric of both is the extra £4.3 billion added on to the savings! So, when is all this going to happen?? When do we start receiving the prize?? What are the rewards going to be? So far, the only rewards, civil servants have had from government, for saving £14.3 billion, and clearly doing a very good job, is a slap in the face, ‘hot air’ rhetoric and the imposition of an archaic performance system based on threat management! – the civil service will never move forward or innovate when it is under such archaic restriction and thinking. I have told my nephew who is looking at his future job prospects and is very clever, not to join the civil service at any cost. People are no longer respected there.